Simply put, OA is when the smooth covering of two bone ends wears away and causes joint pain and inflammation. It's something that many people live with and many people fear the thought of. When patients are diagnosed with arthritis, at any severity, they feel as if they've just been doomed to a life of pain and inactivity. Patients feel aged, as if their body is giving up on them and that the road ahead is going to be an uphill battle plagued with aches and swollen joints. 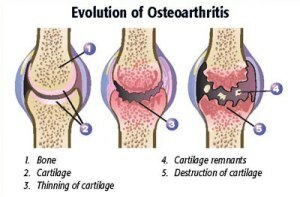 This can be true, when action isn't taken to stop the effects of arthritis from worsening! Where and Why do people get OA? OA can affect any joint in the body but we commonly see OA develop in the knees, hips, spine, fingers (thumb especially), and the big toe. OA can occur in joints which are repetitively over strained, such as the knees in a runner, or the thumbs in a 20 year old video gamer or texter (yes arthritis can develop that young!) Your joints are also more susceptible to wear and tear after serious injury (breaks, strains etc), sudden weight gain, muscle imbalances causing overuse on one side of a joint, and poor postures causing compression forces. Diet has been linked to increasing the chance of arthiritis as well, allowing the joints to receive proper water and nutrients while avoiding inflammatory causing foods can help tremendously. At this stage in science we cannot regrow the cartilage covering of the bones - although we are close :). However, this doesn't mean you can't live pain free and active lifestyles while living with OA. We have many patients with severe OA who now experience little to no pain, and exercise daily doing what they love. It is important to understand that being diagnosed with mild arthritis doesn't mean one day you're destined to progress to moderate or severe, you can slow and even stop the process. With appropriate exercises and stretching to support the joints and take pressure of the nerves, habit changes, and posture/technique training you can give your joints a break and stop the cartilage damage. Moderation and a balance between rest and activity is also important. With arthritis you may feel flare ups, this is your body saying take a step back and rest or reconsider your movements lately. Listening to your body can help you cope with the pains of OA. OA is very common and comes in differing severity. The diagnosis shouldn't be thought of as such an awful condition, it can be controlled. Taking the steps to get properly diagnosed and guided in the right direction is very important to relieving symptoms. Conservative treatments such as light exercise, stretching, and habit change should be the first line of defence before heavy medications, surgery, or cortisone shots. Studies have actually shown conservative physiotherapy intervention can produce the same if not better results than surgery for patients with arthritic joints. So please try methods without knives involved first. There is light at the end of the osteoarthritis tunnel! Older PostCoffee Pros and Cons: National Coffee Day!